CALENDAR OF EVENTS April 22-25	2019 Greater Everglades Ecosystem Restoration Conference, Coral Springs. For more information and to register, visit https://conference.ifas.ufl.edu/geer2019/index.html. May 2	 Suwannee River Basin CARES Awards Presentations, Live Oak. For more information, contact cacee.hilliard@ffbf.org. May 14-16	Florida Farm Bureau’s Field to the Hill Trip, Washington, D.C. For more information, visit https://www.floridafarmbureau.org/fieldtothehill/. 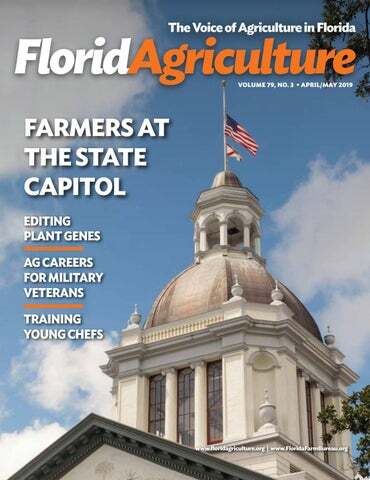 Cover: Florida Farm Bureau members gathered at the state Capitol March 5-6 to discuss public policy with state leaders. See photos inside. Non-member subscriptions are not available. initiative by promoting public awareness of the conservation accomplishments of our farm families. We want all Floridians to know the natural resource benefits these families provide for our state. We will soon introduce another group of CARES award recipients who live in the Suwannee River Basin and adjacent areas. On May 2 all of our guests can participate in an awards ceremony at the UF/IFAS North Florida Research and Education Center near Live Oak. Each awardee will receive a CARES plaque on stage. There will also be opportunities to sample Florida-grown foods and visit with farmers and their families. The event will begin at 6 p.m. I invite you to join us at one of the best fellowship events of the year. Southern highbush is the most commonly grown blueberry bush in Florida. Florida blueberry season peaks in April. Blueberries are native to North America. Alachua, Putnam, Marion, Lake and Sumter Counties account for the majority of Florida blueberry production. FOOD DONATION The Levy County Farm Bureau Women’s Committee recently collected 150 jars of peanut butter for donations to First United Methodist Church Food Bank in Williston, Living Water Learning Center in Morriston and Another Way in Chiefland. Inez Worthington, left, Tina Garrett, Diane Price, committee chair, and Arlene Bell, LCFB president, organized the project. Growing with you for 100 years. Farm Credit has been helping growers like you thrive for generations. Let us help deliver a sunny future for you, too. • Buildings & fences • Equipment • And much more! out of it.” The property, nearly 300 acres of lush landscape with Gum Creek running through its center, has been producing sweet blueberries since that first bush was planted forty years ago. 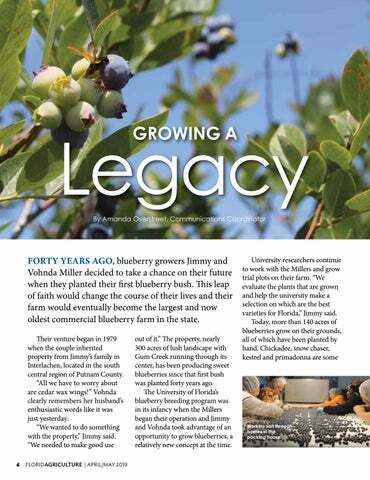 The University of Florida’s blueberry breeding program was in its infancy when the Millers began their operation and Jimmy and Vohnda took advantage of an opportunity to grow blueberries, a relatively new concept at the time. Workers sort through berries in the packing house. 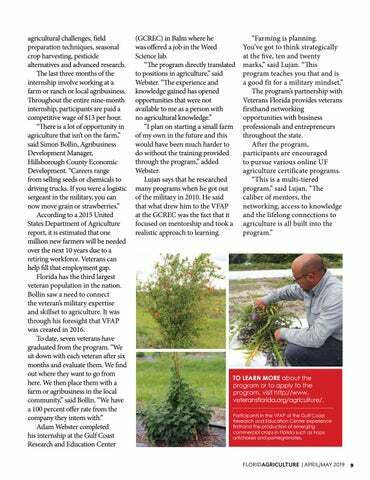 Jimmy and Vohnda Miller in 2019.
crop water use information and help monitor weather data pertinent to their farm. The Miller’s plant nursery is supported by their tissue culture lab. The lab has the capability of propagating blueberry plants at a fast rate for wholesale marketing to other growers. In the packing house, a produce tract is used for traceability. This system allows the Millers to know which part of the field a blueberry came from. “In the event that a problem arises, we can isolate that particular part of the field instead of the whole farm,” Vohnda explained. Although cultural practices have changed over the course of forty years, the “Miller’s Way” of picking and packing has not. Jimmy and Vohnda Miller circa 1979. Christopher Lujan, left, credits Simon Bollin’s personal drive and passion for making VFAP a success. (GCREC) in Balm where he was offered a job in the Weed Science lab. “The program directly translated to positions in agriculture,” said Webster. “The experience and knowledge gained has opened opportunities that were not available to me as a person with no agricultural knowledge.” “I plan on starting a small farm of my own in the future and this would have been much harder to do without the training provided through the program,” added Webster. Lujan says that he researched many programs when he got out of the military in 2010. He said that what drew him to the VFAP at the GCREC was the fact that it focused on mentorship and took a realistic approach to learning. TO LEARN MORE about the program or to apply to the program, visit http://www. 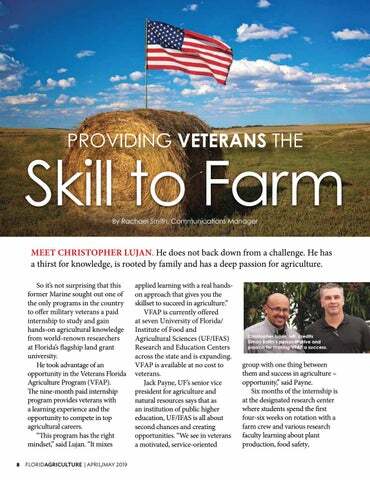 veteransflorida.org/agriculture/. Participants in the VFAP at the Gulf Coast Research and Education Center experience firsthand the production of emerging commercial crops in Florida such as hops, artichokes and pomegranates. BLACKBEARD’S RANCH is a 4,500-acre working cow-calf operation located on the Myakka Prairie in Manatee County. One of the largest intact parcels of land in the region, it faces many pressures of development and urban sprawl. The owners are committed to the conservation and preservation of this and other farm lands around the state. Managing partner Jim Strickland is committed to pursuing conservation easements with the Rural and Family Lands Protection Program and Florida Forever. Created in 2001 and housed in the Florida Department of Agriculture and Consumer Services, the Rural and Family Lands Protection Program is an agricultural An aerial view of Blackbeard’s Ranch. development rights through many programs provided by the government. There are a lot of avenues and organizations to partner with to get a conservation easement,” said Strickland. Strickland, a passionate advocate for ranching and conservation, says that in his opinion there is no closer thing to natural Florida than cattle ranches. If you drive through the property of Blackbeard’s Ranch, you can see why. With native plants and an oak canopy with a sprinkling of palm trees, it is hard to imagine a place more “Floridian” than this ranch. University of South Florida on projects related to water quality, burrowing owls, coyotes and soil and forage. Strickland is also the owner of Strickland Ranch and is involved in managing several other properties in the area which are also heavily involved in conservation projects. In all of the ranches that Strickland manages, one thing remains a constant: his desire to see Florida ranches and native lands preserved. He has dedicated his career to conserving the land and doing what is right for the ranches and the environment. While Blackbeard’s Ranch’s primary focus is the cow-calf operation, the ranch has diversified into various agricultural endeavors. This demonstrates the ability of conservation and sustainable agriculture coming together to feed the state and the nation. These additional enterprises include raising Mangalitsa Pigs, operating a brewery and producing wildflower honey. Jim Strickland, managing director of Blackbeard’s Ranch. The conservation easements help protect water and provide green space in the state. Florida’s farms and ranches provide natural water filters and also help protect wildlife. 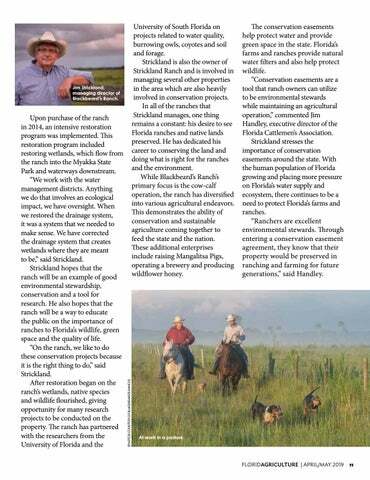 “Conservation easements are a tool that ranch owners can utilize to be environmental stewards while maintaining an agricultural operation,” commented Jim Handley, executive director of the Florida Cattlemen’s Association. Strickland stresses the importance of conservation easements around the state. With the human population of Florida growing and placing more pressure on Florida’s water supply and ecosystem, there continues to be a need to protect Florida’s farms and ranches. “Ranchers are excellent environmental stewards. Through entering a conservation easement agreement, they know that their property would be preserved in ranching and farming for future generations,” said Handley. At work in a pasture. CRISPR Within the past five years, a new editing technology known as CRISPR has given researchers a more precise way to target a particular gene. (CRISPR is an acronym for an appallingly genetic material within a plant. long description of certain DNA They subsequently found that they sequences: clustered regularly could activate the expression of interspaced short palindromic certain genes. repeats). It is easier and cheaper to As currently applied, the tool use than other editing techniques. 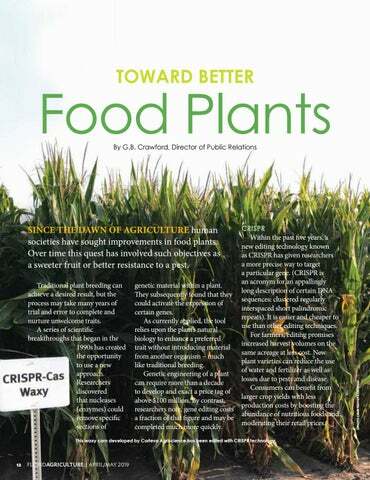 relies upon the plantâ&#x20AC;&#x2122;s natural For farmers, editing promises biology to enhance a preferred increased harvest volumes on the trait without introducing material same acreage at less cost. New from another organism â&#x20AC;&#x201C; much plant varieties can reduce the use like traditional breeding. of water and fertilizer as well as Genetic engineering of a plant losses due to pests and disease. can require more than a decade Consumers can benefit from to develop and exact a price tag of larger crop yields with less above $100 million. By contrast, production costs by boosting the researchers note, gene editing costs abundance of nutritious foods and a fraction of that figure and may be moderating their retail prices. completed much more quickly. This waxy corn developed by Corteva Agriscience has been edited with CRISPR technology. SINCE THE DAWN OF AGRICULTURE human societies have sought improvements in food plants. Over time this quest has involved such objectives as a sweeter fruit or better resistance to a pest. CLOCKWISE: Testing for greening resistance in a UF/IFAS greenhouse; The UF/IFAS team has developed a citrus tree that is close to having complete immunity from canker; Nian Wang, left, and Hang Su, a post-doctoral researcher, are developing several new varieties at the Citrus Research and Education Center in Lake Alfred. applied and the number of people it will benefit,” she added. “Because we can sequence the entire genome very inexpensively right now, we can make a change in a plant by using CRISPR. 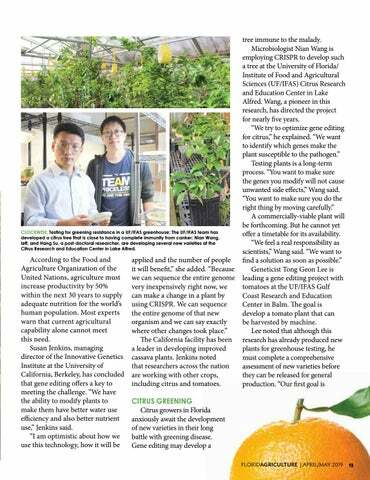 We can sequence the entire genome of that new organism and we can say exactly where other changes took place.” The California facility has been a leader in developing improved cassava plants. Jenkins noted that researchers across the nation are working with other crops, including citrus and tomatoes. Researchers expect that consumers will receive many benefits from gene editing technology in the next decade. Pairwise, is applying CRISPR to row crops as well as fruits and vegetables. Haven Baker, the company’s chief business officer, said the “focus is to make noticeable improvements to the produce aisle. We’re trying to make produce more convenient, more affordable and possibly healthier.” CEO Tom Adams pointed out that Pairwise is designed to operate as a food company. “The amazing, exciting opportunity that CRISPR brought was the ability to start doing things with crops that are in the consumer space,” Adams said. He expects that it will have a large-scale impact on fresh produce by the mid-2020s. The United States Department of Agriculture has expressed approval of gene-edited food plants. In 2018 Secretary of Agriculture Sonny Perdue announced that the agency “does not regulate or have plans to regulate plants that could otherwise have been developed through traditional breeding techniques.” Other agencies, such as the Food and Drug Administration, have not yet issued official positions. COMMUNICATION WITH CONSUMERS Researchers and agribusiness leaders acknowledge the obligation to communicate the value of the technology. “I do believe that the products out there and the things that are nearing production on the market are safe to consume,” the University of California’s Jenkins said. “I would personally consume them. “In the past we as scientists made the assumption wrongly that if we just got out and educated people about what we are doing, they would understand how safe this is, how practical it is and what our intentions are, it would be accepted,” she explained. “It is more about having a conversation with the consumer and what the consumer wants or needs.” Haven Baker of Pairwise is confident consumers will be able to understand the benefits of this work because they will have access to the results in the grocery store. “We think CRISPR will be one of the key tools of this century in meeting the needs of Florida and the rest of the world – to bring better foods to our markets,” Baker said. or too long the Florida Constitution has been used like a grocery list instead of receiving the respect it deserves. Look, I understand amending my grocery list. Too often I have walked into the grocery store with my wife’s list (which she lists in order from the back of the store to the front, by the way) and made a few strategic amendments. It is one thing to get a little fast and loose with my grocery list, but it is quite another to amend indiscriminately the charter document of the third most populous state in the nation. Since the current Florida Constitution was passed in 1968, 181 amendments have been proposed with 133 of the amendments passing. And while I know the comparison is not entirely fair, I cannot help but contrast that with the 27 amendments to the US Constitution in 241 years. You can chalk that difference up to the five separate ways that are prescribed to amend the Florida constitution. One is a constitutional convention, which has not been used in recent times. The second is the legislature can send an amendment to voters by a three-fifths vote of both chambers. 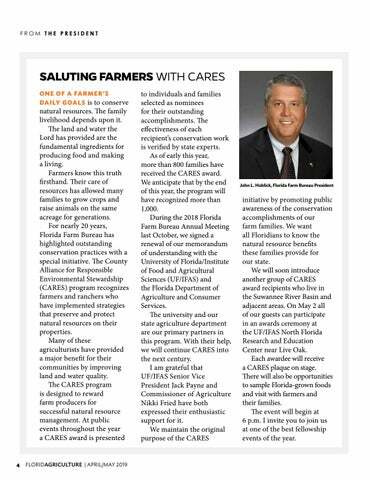 THE FARMERS’ HUNDREDS OF FLORIDA FARM BUREAU MEMBERS traveled to Tallahassee in March for an important agenda. They arrived there to participate in Florida Farm Bureau’s 2019 Legislative Days. Their purpose was to hold discussions of policy issues that are important to farm families with lawmakers and other state officials. Members welcomed guests during a March 5 reception at Florida Farm Bureau’s State Legislative Office. On the next day, they met for a breakfast meeting at Tallahassee’s convention center, where Florida Department of Environmental Protection Secretary Noah Valenstein and Sen. Ben Albritton delivered briefing addresses. After the morning session, Farm Bureau members made multiple office visits with individual legislators until early evening, including a meeting on the Senate floor. The agenda culminated in the taste of Florida Agriculture Reception in the Capitol Courtyard. More than 1,000 members, lawmakers, sponsors, vendors and guests sampled Florida-grown foods provided by agricultural organizations, businesses and volunteers. The Florida Department of Agriculture and Consumer Services co-sponsored the event. 1 Florida Farm Bureau President John Hoblick welcomed Agriculture Commissioner Nikki Fried at the Taste of Florida Agriculture Reception. 2 State Rep. Rick Roth enjoyed strawberry shortcake provided by the FFB Women’s Leadership Committee. 3 State Sen. Wilton Simpson warmly greeted Farm Bureau members from various counties. 4 A large group of Manatee County FFA members was on hand for Legislative Days. 5 State Rep. Jennifer Sullivan hosted members of the Orange County Farm Bureau. 6 Volusia County Farm Bureau visitors held enjoyable discussions with State Rep. Elizabeth Fetterhoff. 7 State Rep. Travis Cummings devoted time to conversations with members from Clay County. 8 Some of the Farm Bureau visitors at the Capitol were ready early for legislative visits. 9 FFB Young Farmers and Ranchers paused for a moment on the Old Capitol steps. 10 State Rep. Keith Perry discussed a number of policy matters with members. 11 Florida Chief Financial Officer Jimmy Patronis, center, greeted FFB State Executive Committee members at his office. 12 State Sen.
Ben Albritton presented an overview of current legislative issues at the March 5 breakfast. Prepped veggies at the Culinary Arts Institute. Maria Kremer of the Culinary Team selects edible flowers. Yuriko Calva is busy making chicken fried mushrooms. Institute of Food and Agricultural Sciences as an “experimental farmer” of sorts. 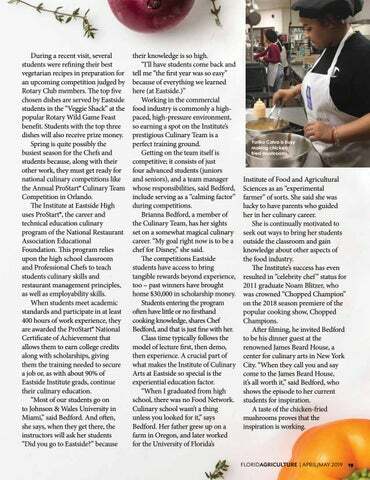 She said she was lucky to have parents who guided her in her culinary career. 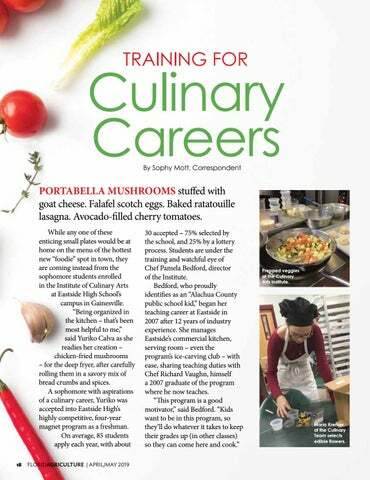 She is continually motivated to seek out ways to bring her students outside the classroom and gain knowledge about other aspects of the food industry. The Institute’s success has even resulted in “celebrity chef ” status for 2011 graduate Noam Blitzer, who was crowned “Chopped Champion” on the 2018 season premiere of the popular cooking show, Chopped Champions. After filming, he invited Bedford to be his dinner guest at the renowned James Beard House, a center for culinary arts in New York City. “When they call you and say come to the James Beard House, it’s all worth it,” said Bedford, who shows the episode to her current students for inspiration. A taste of the chicken-fried mushrooms proves that the inspiration is working. Last year U.S. Sen. Marco Rubio held lengthy discussions with Florida Farm Bureau visitors during the Field to the Hill Trip. the laws passed by Congress. In the past, we have met with officials from the U.S. Department of Agriculture and the Environmental Protection Agency, as well as other administrative agencies that regulate some aspect of agriculture. My Agricultural Law professor referred to administrative agencies as the fourth branch of government – a title bestowed to convey how powerful they have become over the course of our republic’s existence. Of course, Field to the Hill is a busy, three-day event, but it is important to remind Washington, D.C. that farmers and ranchers are involved constituents. And it is equally important that you are in the room when these meetings take place. 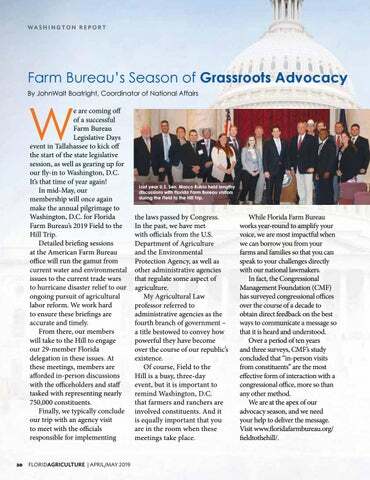 While Florida Farm Bureau works year-round to amplify your voice, we are most impactful when we can borrow you from your farms and families so that you can speak to your challenges directly with our national lawmakers. In fact, the Congressional Management Foundation (CMF) has surveyed congressional offices over the course of a decade to obtain direct feedback on the best ways to communicate a message so that it is heard and understood. Over a period of ten years and three surveys, CMF’s study concluded that “in-person visits from constituents” are the most effective form of interaction with a congressional office, more so than any other method. We are at the apex of our advocacy season, and we need your help to deliver the message. Visit www.floridafarmbureau.org/ fieldtothehill/. “THE BEST THING YOU CAN GIVE SOMEONE IS AN OPPORTUNITY AND TIME. On his operation one of the important BMPs that he utilizes is field and soil mapping. This technology allows him to have an in-depth look at the land and soils he is farming so he knows which fields are the best and which ones he should improve. Jones is very involved in giving back to his community. Each year Jones Potato Farm donates a portion of the harvest to Feeding America in Tampa Bay, a food rescue and distribution organization. Every year, Jones also has people from the community come to learn about his operation. The farm invites the community to learn about agriculture firsthand by hosting farm tours for various school groups. Jones said the students always enjoy the trip to the potato fields and even the parents in the community have positive experiences as well. “It’s a real heartfelt feeling when you see the community connecting with agriculture,” he said. 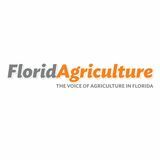 Acres of property in Southeast Florida used to produce potatoes, green beans, citrus and cattle. 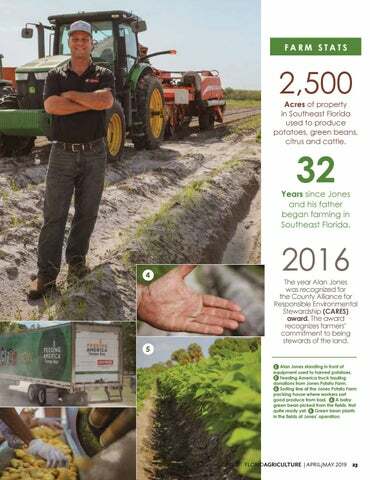 Years since Jones and his father began farming in Southeast Florida. 2016 The year Alan Jones was recognized for the County Alliance for Responsible Environmental Stewardship (CARES) award. The award recognizes farmersâ&#x20AC;&#x2122; commitment to being stewards of the land. 1 Alan Jones standing in front of equipment used to harvest potatoes. 2 Feeding America truck hauling donations from Jones Potato Farm. 3 Sorting line at the Jones Potato Farm packing house where workers sort good produce from bad. 4 A baby green bean picked from the fields. Not quite ready yet. 5 Green bean plants in the fields at Jonesâ&#x20AC;&#x2122; operation. F Buy the AgTag® $20 of your purchase helps educate our kids! Through your purchase of the Florida Agriculture License Plate, Florida Agriculture In The Classroom is able to provide: • Funds for school gardens • PreK–12 agriculture curriculum • Teacher and volunteer grants • Workshops and farm tours • Florida Agriculture Literacy Day • And much more! Visit www.agtag.org to learn more. Don’t miss out on this offer. Visit FordFarmBureauAdvantage.com today! *Class is Full-Size Pickups under 8,500 lbs. GVWR based on Ford segmentation. **Max payload on F-150 XL Regular Cab, 8’ box, 5.0L V8 4x2, Heavy-Duty Payload Package and 18” heavy-duty wheels (not shown). Max towing on F-150 XL SuperCrew®, 6.5’ box, 3.5L EcoBoost® 4x2, and Max Trailer Tow Package (not shown). ***Farm Bureau Bonus Cash is exclusively for active Farm Bureau members who are residents of the United States. This incentive is not available on Shelby GT350®, Shelby® GT350R, Mustang BULLITT, Ford GT, Focus RS and F-150 Raptor. This offer may not be used in conjunction with most other Ford Motor Company private incentives or AXZDPlans. Some customer and purchase eligibility restrictions apply. Must be a Farm Bureau member for 30 consecutive days prior to purchase and take new retail delivery from dealer by January 2, 2020. Visit FordFarmBureauAdvantage.com or see your authorized Ford Dealer for qualifications and complete details. and salads such as this Tomato, Feta and Basil Salad provide easy-to-prepare versions of Mediterranean cuisine. Incorporating Florida tomatoes along with basil and the salty, milky flavors of feta cheese makes the salad a Mediterranean dish. In addition to Mediterranean food, the trends report highlighted Middle Eastern cuisine and Latin American flavors as areas of the world that will influence dining here in the next year. Additionally, LDEI highlighted these regions as likely to be influential in the next three years: 1. East Africa 2. The Balkans 3. The Caribbean Sea Find full results from the report and learn more about the organization at LDEI.org. •	Preheat oven to 350 degrees. Preheat a large cast iron skillet (or other oven-safe pan) over medium-high heat. •	Brown the sausage then add in corn, carrots, celery, onion, all-purpose seasoning, fresh herbs and sauté for five minutes or until vegetables begin to soften. •	Remove from heat and pour mixture into a large bowl. Add crumbled cornbread and toss to combine. $$$ WANTED $$$ Tractors, Mowers, Farm Equipment and Related Parts Any Condition. Call 813-626-2609. 5 V-crimp GalvaLume Roofing & Accessories For Farms & Ranches. Cypress Feed Trough & Mineral Boxes Call: 772-473-1714 tripsonmt@aol.com Ask for Mark. FEED & HAY COASTAL BERMUDA HAY Barn stored-$50, Field kept-$40 Irrigated and fertilized. Frank Quincey Levy County 352-538-7077 or 352-463-2953 PREMIUM HAY & SPRIGGING SERVICE: Jiggs, Tifton85, Perennial Peanut, Coastal. Horse-quality square bales (limited rolls), fertilized & irrigated fields. Feed stores welcome. Clean digging stock. Call Haystack Farms at 386-963-3505 or 855-326-8873. www.haystackfarms.com. FISHERIES FLORIDA FISH FARMS Bass, Bluegill, Catfish, Grass Carp (Permit Req.) & Koi (Ornamental Carp) Contact: Florida Fish Farms, 9684 CR 705, Center Hill, FL 33514. 352-793-4224. Visit our website: www.floridafishfarms.com. PONDSTOCKER Bass, Bream, Catfish, Tilapia, Koi, Grass Carp, Shinners and Gambusea Minnows. Pond Supplies. Licensed and experienced. Call today! Cal Trotter. 1-321-952-9176. Palm Bay, FL. SHONGALOO FISHERIES Channel catfish, certified Florida bass, bluegill, grass carp, shellcrackers, warmouth, koi, and gambusia for stocking. See complete list at www.shongaloofisheriesinc.com. Hampton, FL. 352-468-1251. Pre-order your Baumalight generator now for delivery in 8 weeks and get an 8% discount. GOOD THINGS TO EAT FARM BUREAU BUYER’S CLUB Check out the back page of the magazine for the Buyer’s Club June Sale. We’re offering Coloma Fresh Frozen Fruits and Vegetables along with a variety of Farmland products! REAL ESTATE POOLE REALTY, INC 127 HOWARD STREET LIVE OAK, FL 32064 Office: 800-557-7478 All Realty Services www.myallrealty.com 0.34 acre, lakefront cottage on Cherry Lake, fully furnished. 1br/1ba. Madison, FL. $120,000 95.93 acres, gorgeous land with pond and solid home. 3br/2 ba. Madison, FL. $490,000 150 acres, gorgeous home & barn on rolling land with planted pines. Greenville, FL. $549,000 98 acres, perfect hunting/farming land with open cypress ponds. Greenville, FL. $425,000 33.26 acres, wooded area for hunting or clearing for homesite. Jennings, FL. $92,900 55 acres, freshly cleared land, great for planting crops or development. Madison, FL. $154,000 305 acres, cattle ranch with 3br/2ba home. Madison, FL. $1,500,000 440 + acres, working cattle farm with wellbuilt cattle coral and 4 br mobile home. Greenville, FL. $995,000 345 acres, cattle ranch with 1250 square ft. home and out-buildings. Madison, FL. $1,150,000 180 acres, hunting tract in Madison County. Greenville, FL. $486,000 17 wooded acres, good for future homesite. Greenville, FL. $50,000 Gary Silvernell, Realtor Associate 334-355-2124 CAPITAL GAINS TAX FORGIVEN CAPITAL GAINS tax legally forgiven, on the sale of Real Estate, Stocks, C-Corps, S-Corps, Livestock, Family Businesses, and even if selling to family members without having to do a 1031 exchange. We have the capability of converting taxable income to tax Free, lifetime income. INHERITANCE TAXES ELIMINATED-Maintain 100% control of your current assets. Magnify the value of your estate for your heirs TAX FREE. Hoffman Associates (754) 755-1212 Poultry Layer-Breeder Hen Facility in NE Florida. 49.19 ac. ; five, modern and updated, cage-free layer houses capable of conversion to breeder hen houses; generators; a 40’ x 100’ equipment building; and a four-bedroom, two-bath manufactured home. The farm is certified organic, Egg-Land’s Best, Publix, and numerous other certifications. Contact Larry Saucer @ 386-365-1794. Saucer Realty & Capital. 10 Berne's river 11 One of a cereal trio 12 Bar fixture? 13 Tampa's time zone 18 Have an edge against 22 WWII female 25 Pale as a ghost 27 Butcher's offering 29 Approach boldly 31 Break in relations 33 Kind of pad 36 NBC show, "______ Got Talent"
Solution available online at FloridAgriculture.org or in next issue. LABOR HOUSING ATTENTION GROWERS Labor Housing for H2A and/or Domestic Workers available… EXCELLENT LOCATION (Western Palm Beach County) Approx. 1 hr. drive to Boynton/Delray, Vero/Ft. Pierce and Devils Garden Full Kitchen and Mess Hall Permitted and ready for immediate occupancy Capacity: Up to 1,000 persons Contact: Chuck Royal (561) 996-6581 Ext. 113 Also additional location in Moore Haven Glades County. Call for details. REAL ESTATE 5 acre residential lot in Lucerne Valley, California. Nice area, $85,000. Close to both Los Angeles and Las Vegas. 305-323-3910 Five acres in Interlachen. One block off S.R.20. Beautiful, high and dry. Must see. $25,000. Contact Danny at 386-867-3478. Maury L. Carter & Associates, Inc. Licensed Real Estate Broker CONTACT Daryl Carter or John Evans 407-422-3144 - www.maurycarter.com HAW CREEK RANCH & TIMBERLAND, PRICE REDUCED Flagler County-1200± Acres - Located in Flagler County, Florida, Middle Haw Creek Ranch and Timberland offers a variety of uses. Whether you are an avid outdoor enthusiast, a hunter, a cattle rancher, or a timber investor, this property offers it all. The property is located near large metropolitan areas and Florida’s east coast, making it easily accessible. The land can be described as “Old Florida” Pine Flatwoods with scattered cypress heads, oak hammocks and palmetto stands. This property is teeming with wildlife. Deer, turkey, hogs, and other Florida wildlife species call this property home. Hunting, fishing, camping, and other outdoor activities are readily available and ideal for this site. BRING OFFERS!!! NOW $4200/ acre or $5,040,000 - WAS $5,880,000 or $4,900/acre INDIAN RIVER CITRUS GROVE, UNDER CONTRACT - Indian River County, 491± acres. Active citrus grove and engineered agricultural land perfect for all types of farming operations. This property is fully engineered and currently operated as a fresh fruit citrus operation. Potential uses include continued farming for citrus or conversion into other agricultural ventures. Grove was set and has been reset through the early 80s through the 90s. NOW: $ $1,900,000 ORIGINALLY: $2,405,900 LAKE HARNEY PINES - 123+/- acresLocated SE of Lake Harney, Volusia County, FL-This 123+/- acres is perfect for timber investment, recreational uses, hunting and other outdoor activities. Conveniently located 45 minutes from Orlando, make this your own perfect weekend getaway. The property is secluded and offers ultimate privacy. Deer and turkey are abundant. Located minutes away from the St. Johns River, which offers additional recreational boating and other opportunities. Long term timber investment opportunity. ASKING PRICE: $367,770 or $2,990/acre. For Sale located in Hollister,Fl. Pasture land-130 acres; 30 acres planted pines. Fenced and cross-fenced. House has 1bed/2b, garage, very large LR, new metal roof. Currently zoned agriculture. $600,000. No owner financing. Interested call 386-328-4016, 386-350-0532, or 386-972-0156. 9 tracts.. 5 to 101 ac. tracts on US 84 and US 331 bypass in Opp Alabama. Major beach route. Call for prices. North Central Florida business for sale. Pastured chicken, turkey, pork and eggs. Farmers market sales average 6 figures last 4 years. Loyal customer base. Established 2009, Salatin model. Will train. 352-372-2684. 150K. Loans made for farmers by farmers, since 1916. Farm Credit is the nation’s leading provider of credit to agriculture and rural America. Direct from the farm! “Super Sweet” Jumbo Size! Also Available: Microwave Onion Cookers (set of 4): $9.95 Onion Blossom Kit Cutter, Batter and Blossom Sauce! $11.45 per set Back by Popular Demand! At the USDA Center for Medical, Agricultural and Veterinary Entomology in Gainesville, scientists test how effective different compounds are at protecting against mosquitoes and stable flies. Stock your Freezer with Coloma Michigan Fresh Frozen! Troyers Cheese from Amish Country! ONE OF A FARMER’S DAILY GOALS is to conserve natural resources. The family livelihood depends upon it. The land and water the Lord has provided are the fundamental ingredients for producing food and making a living. 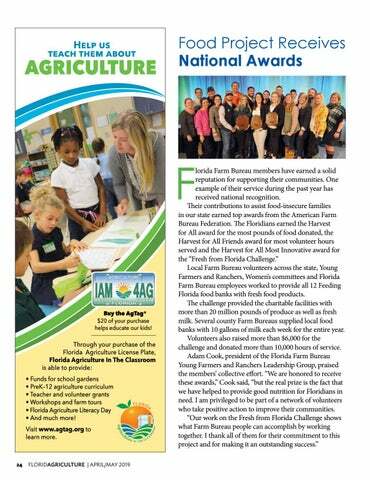 Florida Farm Bureau members have earned a solid reputation for supporting their communities. One example of their service during the past year has received national recognition. ALAN JONES, OWNER OF JONES POTATO FARM, is no stranger to the produce world. 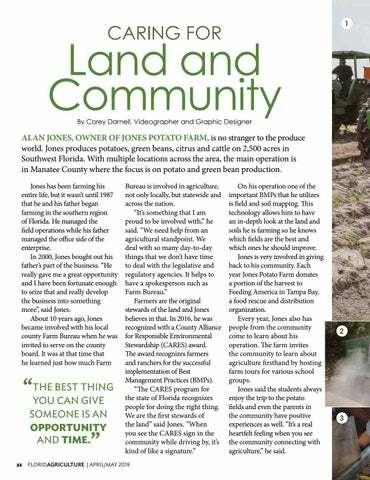 Jones produces potatoes, green beans, citrus and cattle on 2,500 acres in Southwest Florida. With multiple locations across the area, the main operation is in Manatee County where the focus is on potato and green bean production. We are coming off of a successful Farm Bureau Legislative Days event in Tallahassee to kick off the start of the state legislative session, as well as gearing up for our fly-in to Washington, D.C. It’s that time of year again! 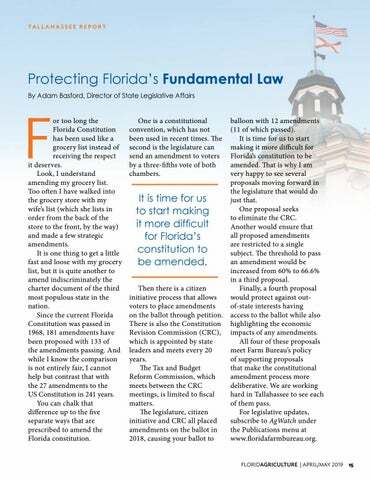 For too long the Florida Constitution has been used like a grocery list instead of receiving the respect it deserves. PORTABELLA MUSHROOMS stuffed with goat cheese. Falafel scotch eggs. Baked ratatouille lasagna. Avocado-filled cherry tomatoes. 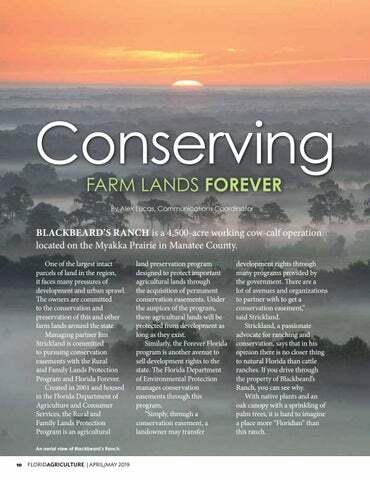 BLACKBEARD’S RANCH is a 4,500-acre working cow-calf operation located on the Myakka Prairie in Manatee County. MEET CHRISTOPHER LUJAN. He does not back down from a challenge. He has a thirst for knowledge, is rooted by family and has a deep passion for agriculture. 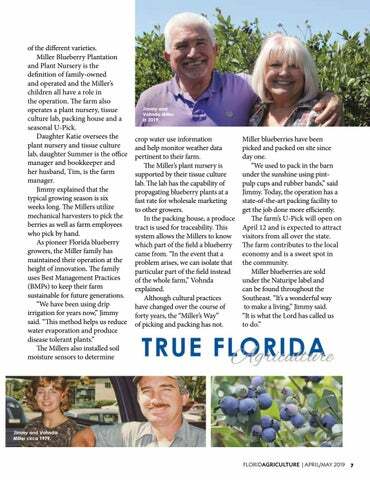 FORTY YEARS AGO, blueberry growers Jimmy and Vohnda Miller decided to take a chance on their future when they planted their first blueberry bush. This leap of faith would change the course of their lives and their farm would eventually become the largest and now oldest commercial blueberry farm in the state. SALUTING FARMERS WITH CARES - ONE OF A FARMER’S DAILY GOALS is to conserve natural resources. The family livelihood depends upon it. The land and water the Lord has provided are the fundamental ingredients for producing food and making a living.